On Wednesday, I showed you this sketch done while riding a Metro bus during a work assignment. In that case, I engaged my subject and asked for permission to draw him. But don’t think I do that all the time. On my regular bus route, for example, I prefer to remain anonymous and sketch surreptitiously. The drawing above is one of those examples. The writing next to the person I drew, with the exception of the note about his shoes, doesn’t have anything to do with him. You can click over the sketch to see a larger image where the handwriting should be more legible. Subway Life, by Portuguese artist António Jorge Gonçálves. 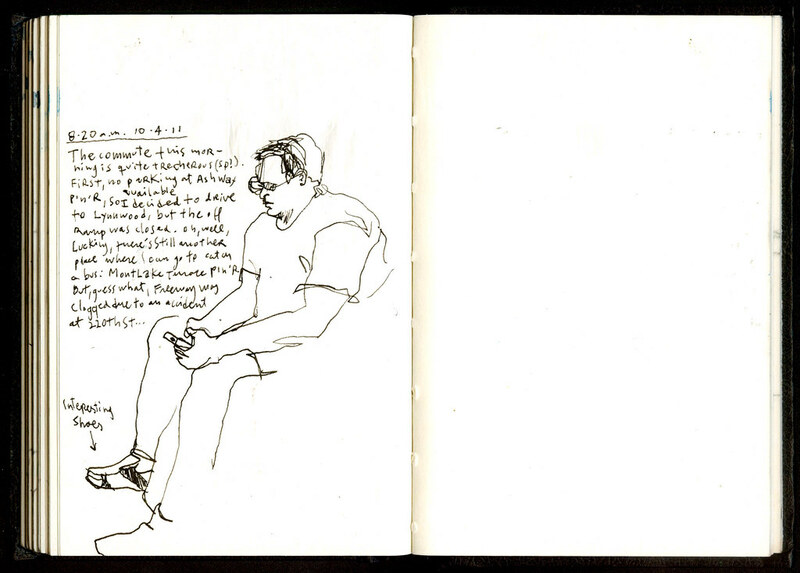 Sketchbook of people on public transportation, by London artist Adebanji Alade. About the sketch: Lamy Safari Fountain pen with Noodler’s black ink on 4″ x 6″ Gamma Series Stillman and Birn sketchbook.